Glimpsing an eye-popping vista or fulfilling a thrilling experience is usually how we remember the best of our travels. But it's often an everyday ritual that can really bring our adventures to life and send our senses wild: eating. High-end restaurants and world-class chefs may have set up shop in this cosmopolitan Asian nation, but don't be tempted – Singapore's best fare lies outside. In a place where eating is regarded the national pastime, its famed hawker centres (open-air food complexes) are a firm national treasure. And with the country a bubbling stew of Chinese, Malay and Indian flavours, the boulevards and avenues, lined with stalls, often dance with delightful aromas. Serving everything from wonton (dumplings) to shredded chicken and noodles, Singapore's roadside eats are a Mary Poppins'-style bag of Asian cuisine. And while it's very popular with ravenous locals, don't let that put you off: queues are often a tell-tale sign of the greatest grub. In 2016, two of Singapore's food stalls cooked themselves into the record books, being the first street vendors to be awarded a Michelin star (without the price tags to match). Need we say more?! 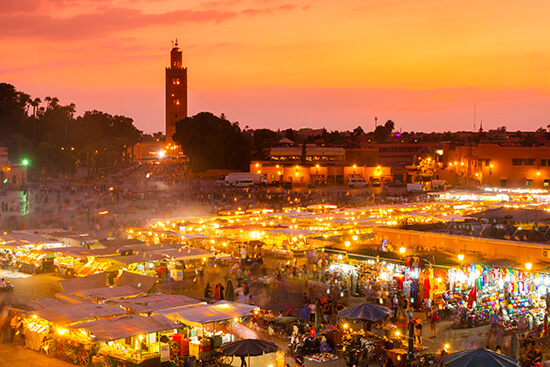 Souks are synonymous with Marrakech. They cluster in Djemaa el-Fna, the Moroccan city's main square, where locals invite you to barter for everything from handwoven goods to spices. At night they take on a new lease of life, as thick steam casts a cloud over the square with locals cooking up home-grown meals. You'll have to follow your nose past snake charmers and musicians as you wind the incredible banquet of delicacies you and your belly can choose from. Meloui (folded pastry) can be bought straight from the stove, while tagine and harira are just two of a spread of Moroccan dishes all available here. If you're queasy about strange food, then be wary here – dishes range from freshly-squeezed orange juice to snail soup and roasted sheep's head. Marrakech's street scene isn't limited to its main square, either. Dart down its labyrinthine side alleys for a quieter mealtime and pick up some houmous, or if you've got a sweet tooth, tuck into chebakia (sesame cookies). Yum! It's no surprise the Mexican capital is an epicentre of good street food. They've been doing it for years, centuries in fact, and even the Spaniards were amazed by this off-the-road immediacy of dining when they arrived in the 16th century. Mexicans have been cooking up these snacks for so long, that you'd be likely be chowing down on something close to what the Mayans and Aztecs would have enjoyed. However, Mexico City is colossal in size and so is its street food scene, so on a first glimpse it can hit you like a culinary wall. But as you weave in and out of the endless tacos, tortillas and the tostadas, you'll quickly realise this is the city's beating heart – and where you want to be. There's enough choice to easily eat on the street from breakfast through dinner. Wake at sunrise to the coiling wisps from cooking pots steaming a batch of tamales (filled dough in a banana leaf), before grabbing a chorizo-stuffed torta. If you've still got room, the late-night scene also offers a rich selection: skewered corn known as elotes, tantalisingly hung from tri-wheeled stands, while the sweet notes of churros and its chocolate dip fill your nostrils (and your belly). Delicious. 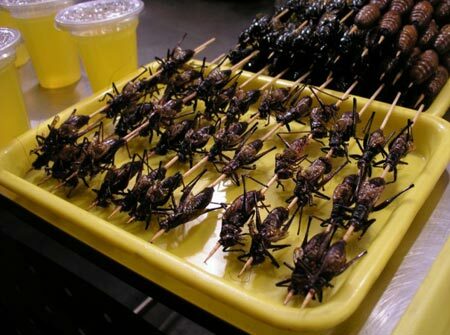 Many believe the Chinese capital's headlining street eats are all about its well-known oddities: deep-fried grasshopper, roasted scorpion, to name a couple. But it's not all about bugs on sticks here, Beijing's hutongs (alleys) are thick with stands and open windows serving food practised over China's several dynasties. Chilli-packed jianbing (crepes) pack a punch, while hot and spicy shrimps are the snack of choice along Guijie – Ghost Street. As you meander alleyways and bustling bazaars, you'll find temptation everywhere with buns hissing from steaming pots, buckwheat noodles generously smothered in a sesame sauce and huge circular pans stuffed with grilled fish. Authorities have clamped down on hygiene regulations in recent years, meaning the stalls have thinned, but don't let that put you off: Beijing's street food scene isn't going away anytime soon. Turkey has sadly been in the headlines for the wrong reasons in recent times, but Istanbul's street food culture is richer than ever. Locals see it as a way of life, nabbing a fresh-out-the-oven simit on their lunch break or gorging on a potato and spinach-packed borek on their way home from work. You can be an Istanbulite, too, just by eating. Imagine grabbing a balik ekmek (fish sandwich) and heading for the banks of the Bosphorus, before nibbling away while musing over the spectacular Hagia Sophia across the water. 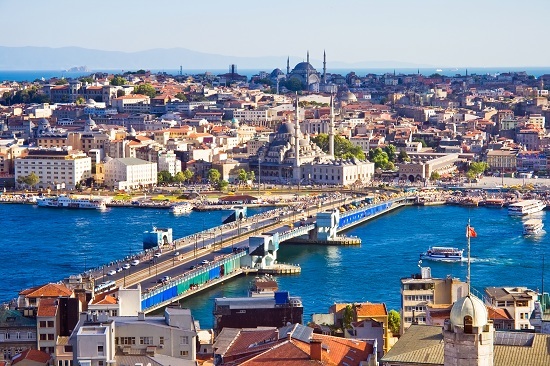 It's not just Istanbul that's represented here – the appetites of both locals and tourists is so strong, you can taste regional specialities from across Turkey, without having to leave the city. Turks love nuts as well, and roasted chestnuts and almonds are aplenty among the vendors, carts and doorways and make for perfect pocket snacks to take with you round Istanbul's top sights. Wander The Big Easy's streets and you'll see a burgeoning number of brightly-coloured food trucks. And the vibrancy of these moving street kitchens is matched by the grub they serve up – a direct result of New Orleans' patchworked history. Curbside, you can find everything from Creole, French and Irish fare and many of its distinctive eats are native to the city. Sandwiches are something of a speciality here and the envy of American cities nationwide. The roll of honour is lip-lickingly good: po' boys, a sandwich filled with beef or fried seafood, is a house favourite, while the Italian meats 'n' cheese combo makes the muffuletta a popular choice among Louisianans. It's an unrivalled amount of choice at lunchtime. You'll also spy oysters chilling in ice-filled buckets – a tasty reference to New Orleans' watery geographical position – and if you've got a sweet tooth, you're in luck. The French influence comes as deep-fried in the form of beignets (doughnuts) or as the fudge-like pralines, often hand-made while you wait. But head there in February and at the height of Mardi Gras and everything is amplified: a frenzied festival season with a huge variety of street food to get your appetite going. Make an appointment with one of our Travel Experts to book your food-inspired holiday.